Fish is best eaten within sight of the sea in my view and perfectly placed in the arches next to Brighton the restaurant Riddle and Finns gets a huge tick. If you are booking ask for a table in the window. 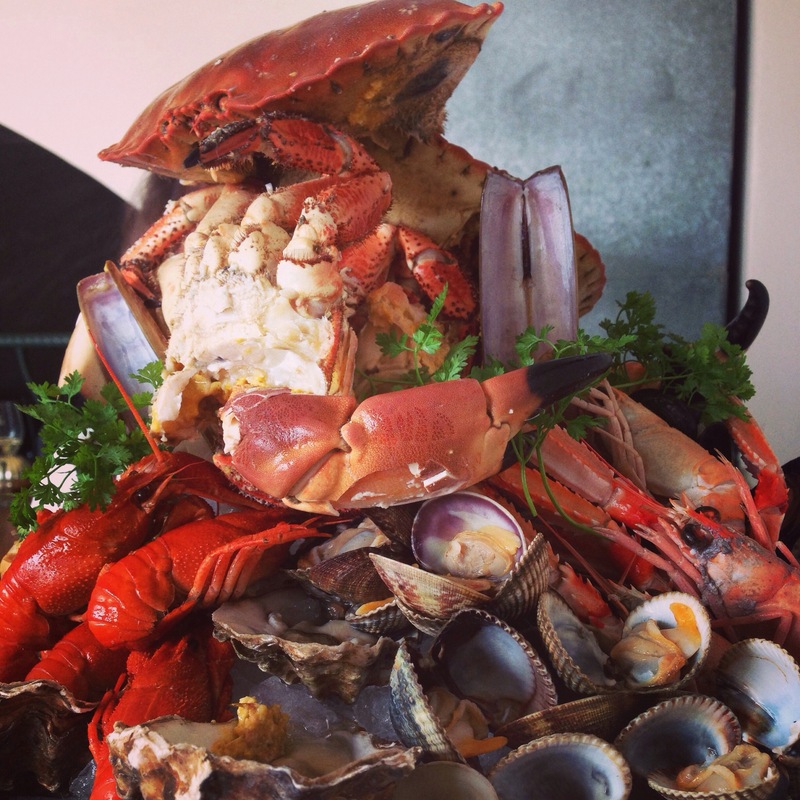 The menu offers a large selection of seafood dishes including fish pie at £14.50 to wok fried crab at £17.50 up to Lobster fruit der mer platter at £40. There are a couple of vegetarian dishes but my advice is if you don’t like fish then don’t go. We had started with a half dozen plump Rossmore Rock oysters at £13 washed down with some “foaming tankards of black velvet” – champagne and Guinness, delicious. For main we had two crab fruit der mer platters at £35 each, not cheap but oh my what a size. Piled high came a whole crab, shell and claws helpfully cracked, and stacked around mountains of delicious shellfish. Prawns, shrimps, langoustines, crayfish, winkles, cockles, mussels, more oysters, razor clams and whelks. There were finger bowls and various implements to extract the food from their assorted shells. I’m no stranger to shellfish so tackled the pile with abandon although I imagine the sight might be a little daunting for the uninitiated. The platter certainly turned a few heads. Take your time but beware the melting crushed ice it’s all piled on, not quite as appetising to pluck a drowned mussel from iced water and have to drain before eating. We washed the meal down with a bottle of something cold and french which had a hint of apricots but whose name escapes me. The staff were attentive but just slightly off what you expect for these prices, a little slow to clear our waste shells and a little unsure of table laying. We couldn’t manage all the food so took some crab and prawns home, although to be honest in a London kitchen two hours later it wasn’t nearly as appetising. My advice still is eat fish by the sea and Riddle and Finns is a good place to do it. This entry was posted in Eat by stevemyalleats. Bookmark the permalink.